Based on the Intel Atom C2000 processor, ETX-2v offers different flavors for interfaces, performance, and storage. ETX-2v is a new carrier-grade white box, installed at the customer premises (either at headquarters or in remote branch sites) to support a wide range of business customers and user scenarios, from small offices to large sites, using a variety of bandwidth and processing power options. ETX-2v can be used with RAD’s pluggable modules to fit any access media, while RAD’s vCPE-OS, a carrier-grade operating system for network edge virtualization, optimizes data plane efficiency and integration to third-party orchestrators and SDN controllers. The ETX-2v x86-based server hosts virtual functions (VFs) and applications. It uses RAD’s vCPE-OS, which includes standard KVM hypervisor and OpenStack compute node to support third-party applications. RADview D-NFV Orchestrator enables service chain configuration. For business services applications, ETX-2v fits any vCPE implementation mode: centralized, de-centralized or a mix of both. In centralized deployments, ETX-2v acts as a pCPE (physical CPE), thanks to decoupling universal CPE software (vCPEOS) from hardware (any x86 server or RAD’s ETX). ETX-2v ensures remote, agile deployment of value-added services with D-NFV Orchestrator for device management and VIM (Virtualized Infrastructure Manager). When hosting an SD-WAN VNF, ETX-2v reduces networking costs and ensures fast deployment of Business services over any infrastructure. Service providers can offer self-service portals, as well as application-aware visibility and control. Coupled with RAD’s pluggable smart SFPs (such as MiRIC and MiNID), ETX-2v offers the unique value proposition of a carriergrade whitebox. 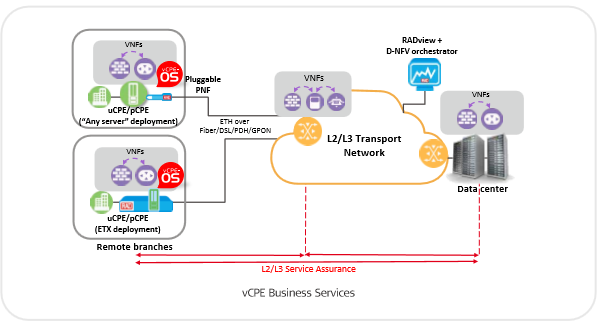 Using RAD’s innovative vRIC solution for pluggable MLPPP interfaces, service providers can offer fiber access to their customer base connected to TDM access (E1/T1, E3/T3). The solution comprises an Ethernet over TDM smart SFP and a VNF bonding multiple smart SFPs into a single, logical MLPPP link. Eliminating separate power, cabling and rack space needs, ETX-2v ensures functional consistency across multiple hosting devices. features open architecture for underlay networking and service overlay with RAD’s vCPE-OS. The open NFV/SDN architecture facilitates integration with network-wide orchestrators and controllers. E-mail: Webmasterabout the RAD portion this site.